Stop for a second. Are you sure you should Post that on Facebook? Have you ever been disappointed by a Facebook Post you thought would do really well? Have you ever wondered why? In this article I’ll give you 7 simple questions that you need to ask yourself before you Post that Facebook Post. ** I’ll give you concrete examples so you know exactly what I’m talking about. And I’ll explain why asking these questions can mean the difference between a Posting success and a Posting flop. Pay attention, because I’ll also be dropping more than 20 Facebook Posting statistics, as well as four top tips that could change how you market on Facebook. Competitors please stop reading now. 1. Am I posting at the right time? Posting times, frequency, and the day you Post have serious repercussions for the success of your Posts. Ever wondered why a seemingly Likeable Post flopped? Bad timing could be why. How can I know when my fans are online? Facebook’s new analytics program Insights has a handy ‘When your fans are online’ tab, making it simple for businesses to get specific data about their Followers. You can view data for both time and day, making it easy to Post when most of your Fans will see it. For global companies like Converse, timing is even more important to reach people in different timezones at optimal times. They’ve found that Posts between 10:30am and 12:00pm work best in both the UK and North America. This is why two of the four Posts below were Posted at 4:00am PST. An easy way to consistently Post at optimal times, like Converse does above, is by using Facebook’s Scheduling tool (here’s a how-to). You can also use an app like Buffer. Buffer allows you to set the times per day that you want to Post, and then fill up each timeslot when you ‘Buffer’ a new piece of content. Studies are also showing (and these I believe) that the optimum amount of Posts per week may be less than you think. One or two Posts per day receive 32% higher “Like” rates and 73% higher comment rates when compared to three or more per day. BuddyMedia did a study suggesting that Posts on Thursdays and Fridays resulted in an 18% increase in engagement and weekend Posts get 69% higher interaction. But again, test this for your own business. It’s tempting for social media users to think of brand Posts as spam (because you can’t show them a picture of their adorable nephew), so I recommend keeping your Posts rare and awesome. The most successful Post structures are questions with double the comments of normal Posts and fill-in-the-blanks with nine times the comments of normal Posts. 2. Is my Post Shareable and Likeable? Getting your Fans to Like and Share your Posts with their friends is the best way to generate awareness and new Fans. A Like or Share is a social recommendation between friends. And more than anything, this is what will bring you new Likes and customers from Facebook. So what makes a Post Shareable and Likeable? Most importantly, ask yourself, ‘ Would I share this Post myself?’ If not, change it! 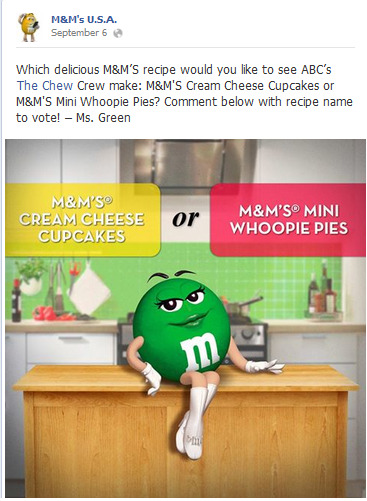 M&M’s used the popular “This vs. That” Post formula, asking Fans to comment on which M&M recipe they would like to see in an upcoming national TV event. The recipe with the most comments wins. Did you see Peyton Manning’s sprained ankle? Should’ve been wearing our AcmeOrthotics [link]! TGIF! This weekend our staff are going to be relaxing at the beach. How are you spending your days off? Advice for the Cubicle Life: Tip #174: Don’t forget your cubicle wall isn’t a real wall. People can hear that phone conversation. 3. Is my Post too long? Posts with 80 characters or less receive 66% higher interaction rates than longer Posts. If you want to go even shorter (around 40 characters in length) you’re looking at around 85% engagement. Just make sure you’re getting your point across. John Deere’s Post below relies on a great photo and a few witty words. This is Post optimization at its finest. It promotes their brand (the DEERE logo isn’t exactly hiding on the side of the tractor…) without screaming it. I also love putting their product in an appealing context - in this case a lumber yard. This appeals to their fan base. Read my article critiquing the Facebook Posts from some the world’s biggest brands for more information on Post formulas..
Top Tip #2: If you thought emoticons were only for 12 year olds, think again. Not only do Posts with emoticons get 33% more comments, they also get Liked 57% more often than Posts without emoticons. That said, I’d test this for your brand before implementing it across the board. 4. Does my Post have a CLEAR Call to Action (CTA)? Checking for a clear CTA is the best way to make sure you’re getting something out of each Post you make. I’ll include 5 of my own top Facebook CTA examples below the example. There are many great CTAs on Facebook. It’s not just about getting people to buy from you. There is no hard and fast rule for what a CTA looks like. The big lesson here is to make sure it’s super obvious what your CTA is. 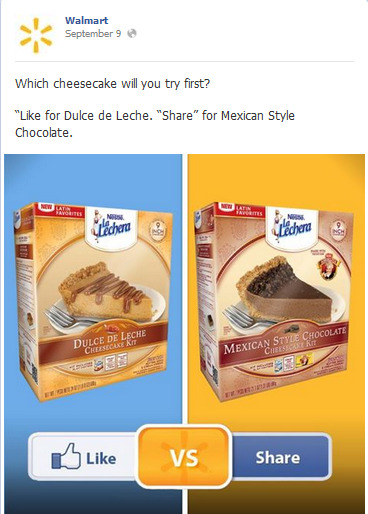 Walmart uses the ‘Share vs Like’ competition (below) as well as any brand on Facebook, and they get fantastic engagement as a result. The competition is a win/win situation for any company. Remember to include products similar enough to make sense, and competitive enough for people to support only one. How are you spending your lazy Sunday? Top Tip #3: A couple of weeks ago Facebook updated their Edgerank Algorithm. Now, all Posts that ‘beg for Likes’ will be downgraded. Keep this in mind as you’re Posting. 5. Is my Post relevant to my audience? Make sure your information isn’t out-of-date or boring. Make sure it’s something your fans would care about. A recent statistic, that only 16 % of Pages organically reach fans on Facebook, makes it all the more important that what does come through to your fans is worth seeing. 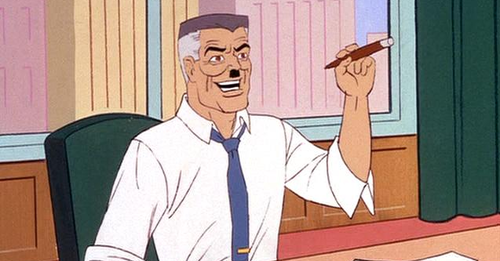 So how can I make my Posts relevant? How can I target my Posts? I’ll discuss targeting more specifically in section 8. Stay tuned! 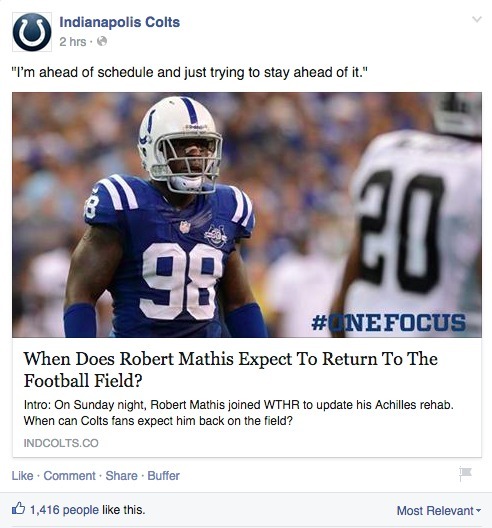 The Indianpolis Colts are a great example of an organization up-to-date with what their social media Followers care about. Each post they make during the NFL season is based around that day’s events. Their Facebook Fans want the most up-to-date information about players, injuries, trades and game highlights. How can you promote your products without… promoting? 7. Have I targeted my Posts? Targeting your posts using Facebook’s built-in targeting features is becoming essential. it means each Post you make is used as efficiently as possible, and not wasted on the uncaring ( 293,000 Posts/minute) masses. Targeting allows you to boost your Engagement Rate and overall Edgrank by only targeting your Fans who will be the most interested. Coca-Cola’s Post (below) uses very specific subject matter to call upon a section of their demographic. Targeted Posts like this use the passion of a Facebook Fan for their hometown, religion, sports team, product loyalty, etc, etc. They can be extremely effective if used properly. Keep in mind this strategy only works if you have a large enough following. If you’re still in the building stages of your brand’s social media profile, go for universal appeal instead. Calling on all NFL fans! Do you prefer A) Our November Golden Ale or B) The Snowy Porter with the game? Hey Seattle, we’re hosting a Q&A with your hometown hero Steve Allen next Friday. What will you ask him? Congratulations to all June graduates! If you’re looking for work experience this summer, why not try Acme Accounting? Asking these questions before you Post will help you see results on your Facebook Page. Remember to use Insights or A/B testing to learn the time and structure your Fans prefer. Try switching up your Posts with questions, fill-in-the-blank, product promotions and ‘Share vs Like’ competitions to keep your fans interested. If you have any questions or comments I’d love to hear from you. Start the conversation below!